Thanks to Dr. Shahrzad Ehdaivand, Women & Infants Hospital and Warren Alpert Medical School of Brown University, Rhode Island (USA) for contributing this case. To contribute a Case of the Week, follow the guidelines on our Case of the Week page. Pathologists’ assistants (PAs) can provide labs with a much-needed, cost-effective way to reduce pathologists’ workloads, both in surgical and autopsy pathology. PAs are trained to assume the grossing, autopsy dissection, and teaching responsibilities previously provided by pathologists, as well as provide administrative support for the pathology department as a whole. Eligible for certification by the ASCP Board of Certification, PAs have met the highest standards for education and training in the profession of pathology, ensuring that your pathology laboratory is meeting the standards of not only your licensing bodies (CAP, CLIA, Joint Commission), but your pathologists and surgeons as well. For more information, visit us online at www.pathassist.org or call 800.532.AAPA. (1) Thanks for visiting us at CAP 2012 in San Diego. Our plans for the next year are: (a) completing our new Topic format for all chapters, (b) obtaining independent reviews and updates of each topic every 1-2 years, (c) making each topic more complete with a more standard format, more content, references and images, (d) adding more images from AFIP fascicles (3rd edition) and contributors, (e) adding links to the WHO Classification of Tumour website, PubCan.org, (f) more frequent link checking of images to remove bad links, (g) better formating for tablets and smart phones. (2) Our Feature Page for the month highlights Antibodies, and includes Cell Marque, Covance, Epitomics, Leica Microsystems and Ventana Medical. 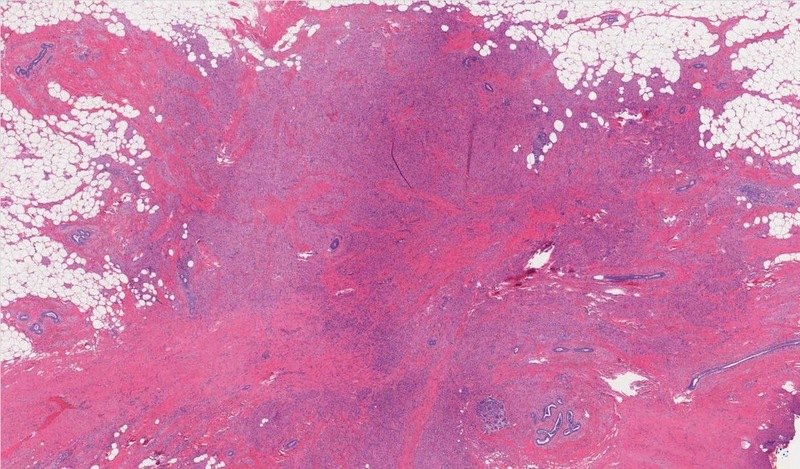 A 64 year old woman had a small irregular mass on her left breast. Granular cell tumors at all sites derive from Schwann cells of peripheral nerves, based on immunohistochemical (Med Oral Patol Oral Cir Bucal 2011;16:e6) and ultrastructural studies. They typically occur in the oral cavity, but occasionally occur in the breast. 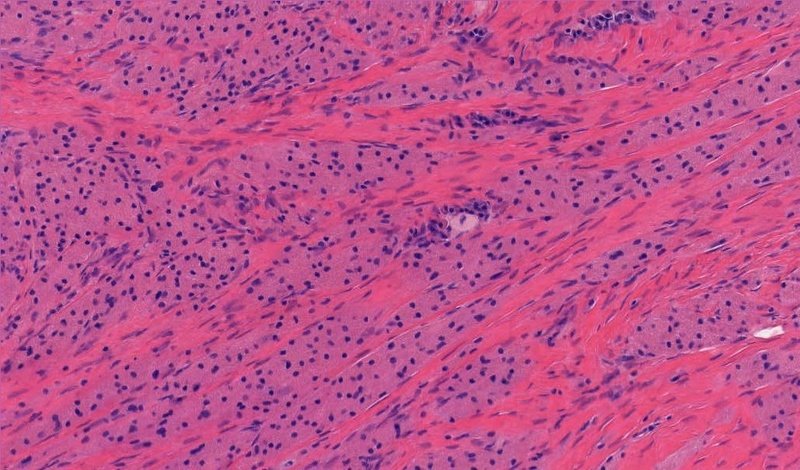 The tumor infiltrates in sheets/cords of polygonal bland cells with well defined cell borders and abundant granular eosinophilic cytoplasm. The nuclei are round/oval, and may have small but distinct nucleoli. The tumor may also contain nonneoplastic perineurial cells (Am J Dermatopathol 2012 Jun 3 [Epub ahead of print]). They have infiltrative margins, and may be close to small nerve bundles. Typically, there is no/rare mitotic activity, and no/mild atypia. The overlying epithelium often shows pseudoepitheliomatous hyperplasia. Clinically and radiologically, granular cell tumors may simulate carcinoma (J Clin Med Res 2010;2:185), although they typically have benign behavior. Malignant tumors are rare (1-2%). 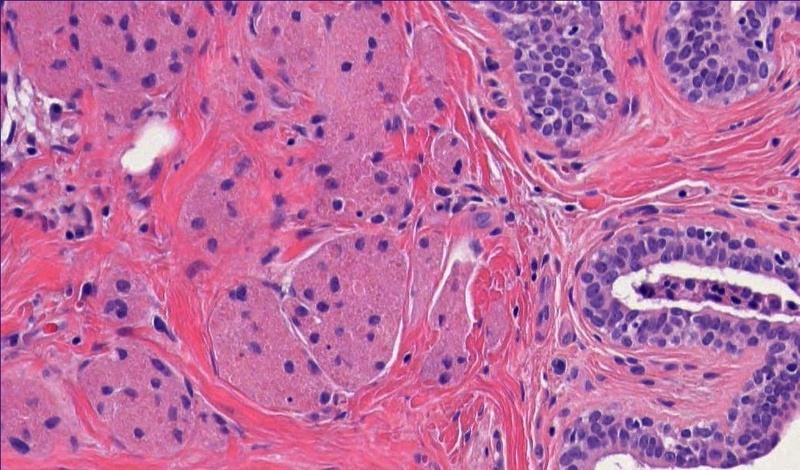 Criteria for malignancy (all sites) include necrosis, spindling, vesicular nuclei with large nucleoli, increased mitotic activity (> 2 mitoses/10 HPF at 200x magnification), high nuclear to cytoplasmic ratio, and pleomorphism (Am J Surg Pathol 1998;22:779). The differential diagnosis includes metastatic granular cell tumor to the breast (Oncol Lett 2012;4:63), alveolar soft part sarcoma (cells divided into packets by thin walled vessels), histiocytic tumors and granulomatous inflammation. 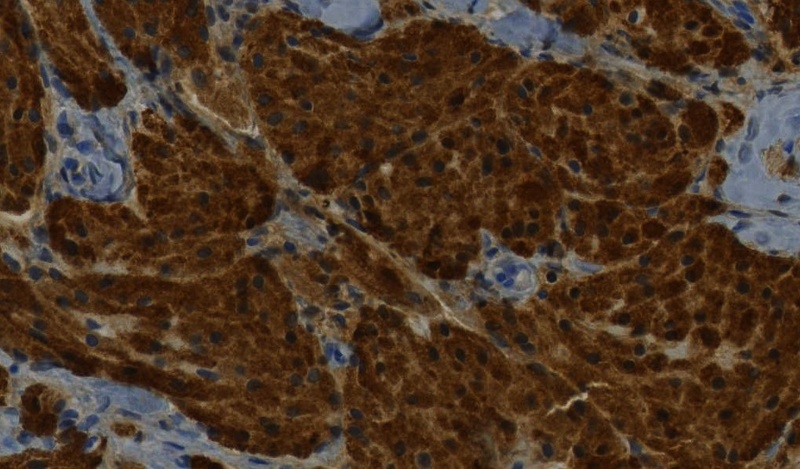 Granular cell tumors are strongly S100+, PAS+ with diastase resistance granules and CD68+. They are negative for keratin, EMA and mucin. Local excision is usually adequate treatment. There is a low risk of recurrence, even with positive margins (Arch Pathol Lab Med 2011;135:890). However, some benign appearing tumors do have malignant behavior.